What can I say? I am SUPER tired and thinking of a title for the post is just too much for me tonight. It's a lot of working having an infant and a toddler! Anyhow, did you see all the new and exciting stuff happening at Unity? It's super fun! They finally explained what Ippity is. And they are having a big sale! Anyhow, here's a quick card I made that I was going to use for last week's FWF post but I changed my mind. I'm a bit tired and busy so you get it this week. :) The bottom of the card base is stamped with Believe Background, it's pretty and florally. And the words come from Butterfly Beauty. The pink paper is SU and the ribbon is from Michael's. The bling is Darice. Hey sweetie your card is gorgeous!! With all those boys a bit of pink is nice huh? :D Love this card, you have been rockin the mojo!! Gorgeous card! I hope you feel better soon! 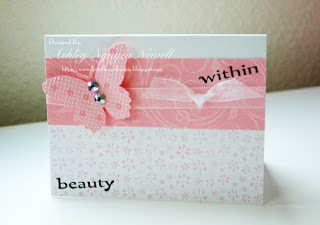 very sweet card, the butterfly is just beautiful! This is so pretty!! Wonderful job! Oh my, what an absolutely gorgeous card! So soft and pretty! Well, you may not have a creative title but this card is nothing short of creative! LOVE the butterfly-my favorite thing and my favorite color! very pretty card and I love the pink! sweet & cute card !! What a beautiful card Ashley! Love it! Great colors and love the butterfly! Pretty!!! Pink & bling, two of my favourite things! Great card Ashley! Pretty in pink! Love the bling! So beautiful! Love the pink & white color scheme! Works so well! I hope you & your family are doing better! Hang in there! You will survive! WOW!!!!! HOLY WOW! This is gorgeous! Aww thats so sweet! I love it! this is simply beautiful! i so feel ya on the title thing - i always struggle with that!